The Kensington Palace published the Coat of Arms created for HRH The Duchess of Sussex, Meghan Markle. The Coat of Arms was approved by HM The Queen and was created by Thomas Woodcock, Garter King of Arms. 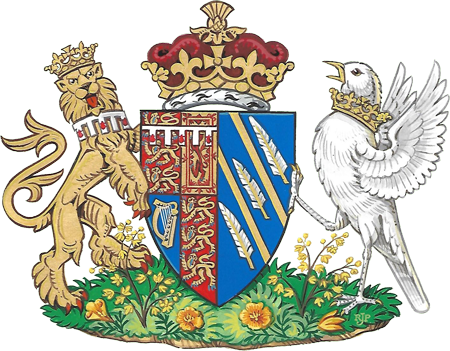 The Coat of Arms is impaled with the Arms of her husband HRH The Duke of Sussex, Prince Harry and it is a symbolic representation of her home state of California and her new home at Kensington Palace. The blue color of the shield represents the Pacific Ocean off the California coast, while the two golden rays across the shield are symbolic of the sunshine of The Duchess’s home state. The three quills represent communication and the power of words. The supporter assigned to The Duchess of Sussex is a songbird with wings elevated as if flying and an open beak, which with the quill represents the power of communication.